Groups representing Western Oregon’s timber industry have sent a letter to the Chairwoman and Ranking Member of the Senate Energy and Natural Resources Committee outlining their opposition to the latest version of Senator Wyden’s flawed O&C legislation (S. 1784), which was approved by the Committee yesterday. The letter outlines how the latest version of the Wyden O&C proposal fails to restore sustainable harvest levels and corresponding timber revenues to county governments, or provide a solution to the environmental litigation that has crippled Western Oregon’s rural, forested communities. In fact, Wyden’s legislation would tip the scales further in the opposite direction, making the situation worse. The Environmental Protection Agency (EPA) announced a new voluntary Drift Reduction Technology (DRT) program. The agency hopes to encourage the use of verified, safer pesticide spray products to reduce exposure and pesticide movement while saving farmers money in pesticide loss. Annually, up to 10 percent of agricultural pesticide spray is estimated to drift or move from the intended target crop — that’s equal to about 70 million pounds of pesticides, valued at around $640 million, lost to drift. In addition, state agencies use substantial resources each year investigating drift complaints. Historic best time for Agriculture? 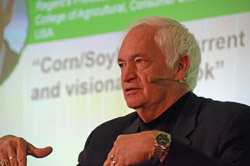 Corn prices may be lower but eternal optimist Dr. Lowell Catlett says it’s still the best of times right now for agriculture. Photo/Christine Souza: Farmer Kenny Watkins of Linden, right, watches as Louis Victoria, a Rural Crimes Division detective with the San Joaquin County Sheriff’s Department, marks the battery of a new piece of farm equipment with the farm’s individual owner-applied number. An owner-applied number helps law enforcement officials return stolen property to its rightful owner. With a statewide metal theft law and county ordinances making it more difficult for crooks to collect cash for stolen metals, rural crime detectives have noticed that fast cash for recycling batteries has become more attractive to thieves. “Thefts of batteries from agricultural vehicles and tractors are rampant throughout the state,” said Sgt. Ryan Hushaw of the Fresno County Sheriff’s Department Ag Task Force, after attending a recent meeting of the California Rural Crime Prevention Task Force. 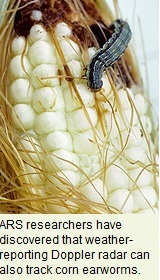 Corn earworms, also known as cotton bollworms, migrate at night, making them notoriously hard to track. Farmers worried about controlling infestations have to make educated guesses about the pest’s movements, based on reports from other areas and past experience. Guessing wrong can be expensive: The pest costs cotton producers an estimated $200 million a year. U.S Department of Agriculture (USDA) scientists in College Station, Texas, have shown that signals routinely collected by the National Weather Service’s (NWS) Doppler radar network could serve as an early-warning system to track corn earworms and other nighttime traveling pests. Agricultural Research Service (ARS) meteorologists John Westbrook and Ritchie Eyster at the Southern Plains Agricultural Research Center in College Station focused on the capabilities of what is known as Next Generation Weather Radar, or NEXRAD. Baseball and modern agriculture share some common ground, in fact, as agriculture’s fast-paced technological advancements are getting the industry in the game of leveraging data. Take, for example, the movie “Moneyball,” the story of the Oakland Athletics (A’s) baseball team and general manager Billy Beane. The central premise of “Moneyball” is that the collected wisdom of baseball insiders over the past century is subjective. Statistics such as stolen bases, runs batted in and batting average, which are typically used to gauge players, are relics of a 20th-century view of the game. Instead, on-base percentages and slugging percentages are better indicators of offensive success, according to rigorous statistical analysis. DECLARING AN EMERGENCY IN SKAMANIA COUNTY, WASHINGTON DUE TO UNHEALTHY NATIONAL FOREST CONDITIONS, YEARLY THREAT OF CATASTROPHIC FIRES, AND, MINIMAL COUNTY GOVERNMENT, SCHOOLS AND EMERGENCY SERVICES. Investigative reporter for The Oregonian Rob Davis released a 2-part series on forestry herbicide use. Unfortunately, instead of relying on facts to drive the reporting, Mr. Davis seems to have started his investigation with the end result already in mind. 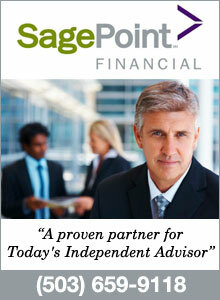 The report relies on speculation and conjecture instead of accurate information to inform the conclusions. In fact, OFS had to reach out to him as there was no indication that he intended to seek out the forest operator perspective at all. Knowing this piece was coming, we have been working with the Oregon Forest Industries Council who put together the piece below about forestry herbicide use. We urge you to use this information when talking about the issue. We are disappointed to see this direct attack on our forestry partners, and will continue to push back against the misinformation. National Farmers Union (NFU) President Roger Johnson said that tax breaks important to family farmers and ranchers need to be extended before the end of the year, and that NFU is looking forward to working with members on both sides of the aisle to solve issues important to family farmers and ranchers. The Oregon Department of Environmental Quality (DEQ) is adopting rules to implement the costly new Low Carbon Fuel Standard (LCFS). This “hidden gas tax” will hurt working families and small businesses, and we need your help. The DEQ’s Environmental Quality Commission will hold a public hearing on proposed rules on November 6. The commission needs to hear from Oregonians who will be affected by this new government regulation. According to a study by the Boston Consulting Group, the LCFS could raise the cost of fuel in Oregon by 33 cents to $1.06 per gallon. This will unfairly penalize lower-income Oregonians who pay a larger share of their income on transportation, and will punish small businesses that are sensitive to high fuel costs. According to estimates, this hidden gas tax could cost Oregon’s economy as many as 29,000 jobs.